Flash Droughts Are Becoming More Common. 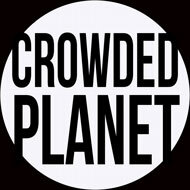 I wanted to bookmark two well-written articles on climate change that contain useful information. Nothing better than a blog post for making a record. Here is a link to download Trajectories of the Earth System in the Anthropocene. The article describes the apocalypse that will probably occur if Earth warms by two degrees Celsius. “Our study suggests that human-induced global warming of two degrees Celsius may trigger other Earth system processes, often called “feedbacks,” that can drive further warming – even if we stop emitting greenhouse gases,” –Will Steffen, lead author of the study published in the journal PNAS. The article is catching lots of attention, but not as much as the Sunday NY Times article by Nathaniel Rich. All the major news media are discussing that article: Losing Earth; the Decade We Almost Stopped Climate Change. 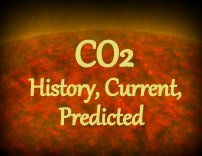 “Like most human questions, the carbon-dioxide question will come down to fear. At some point, the fears of young people will overwhelm the fears of the old. Some time after that, the young will amass enough power to act. It will be too late to avoid some catastrophes, but perhaps not others” — Nathaniel Rich, NYT. Reading Losing Earth followed by Trajectories provides excellent context for the need for climate action. GR: Moving from theoretical to practical, an article in Nature reports on the use of observed global warming to choose the best models for predicting future global warming. Future warming is normally estimated by combining several models. In the new research, the scientists found that the best models actually predict a warmer future than the combined models did. National commitments to reduce emissions have to increase. Abstract: “Climate models provide the principal means of projecting global warming over the remainder of the twenty-first century but modelled estimates of warming vary by a factor of approximately two even under the same radiative forcing scenarios. Across-model relationships between currently observable attributes of the climate system and the simulated magnitude of future warming have the potential to inform projections. Here we show that robust across-model relationships exist between the global spatial patterns of several fundamental attributes of Earth’s top-of-atmosphere energy budget and the magnitude of projected global warming. When we constrain the model projections with observations, we obtain greater means and narrower ranges of future global warming across the major radiative forcing scenarios, in general. In particular, we find that the observationally informed warming projection for the end of the twenty-first century for the steepest radiative forcing scenario is about 15 per cent warmer (+0.5 degrees Celsius) with a reduction of about a third in the two-standard-deviation spread (−1.2 degrees Celsius) relative to the raw model projections reported by the Intergovernmental Panel on Climate Change. Our results suggest that achieving any given global temperature stabilization target will require steeper greenhouse gas emissions reductions than previously calculated.” –Brown and Caldeira. GR: Cinch up your seat belts; CO2 emissions are still rising. 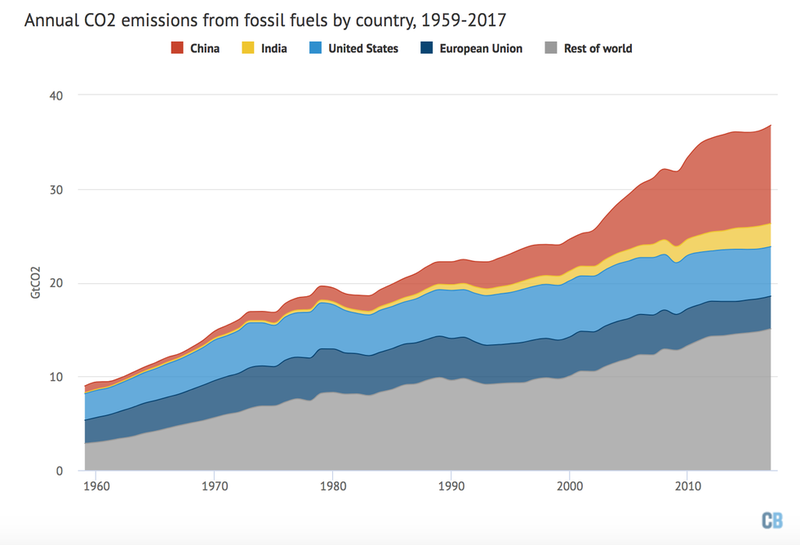 “Over the past three years, global CO2 emissions from fossil fuels have remained relatively flat. However, early estimates from the Global Carbon Project (GCP) using preliminary data suggest that this is likely to change in 2017 with global emissions set to grow by around two percent, albeit with some uncertainties. 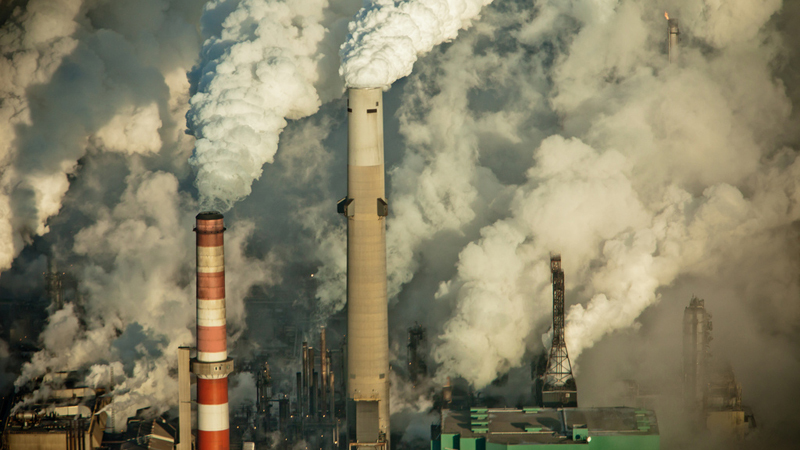 “Hopes that global emissions had peaked during the past three years were likely premature. However, GCP researchers say that global emissions are unlikely to return to the high growth rates seen during the 2000s. They argue that it is more likely that emissions over the next few years will plateau or only grow slightly, as countries implement their commitments under the Paris agreement. “The GCP is a group of international researchers who assess both sources and sinks of carbon. It has published an annual global carbon budget report since 2006. Its newly released global carbon budget for 2017 provides estimates of emissions by country, global emissions from land-use changes, atmospheric accumulation of CO2, and absorption of carbon from the atmosphere by the land and oceans. “The figure below shows global CO2 emissions from fossil fuels, divided into emissions from China (red shading), India (yellow), the U.S. (bright blue), EU (dark blue) and the remainder of the world (grey). After a rapid increase in global emissions of around three percent per year between 2000 and 2013, emissions only grew by 0.4 percent per year between 2013 and 2016. Annual CO2 emissions from fossil fuels by major country and rest of world from 1959-2017, in gigatons CO2 per year (GtCO2). Note that 2017 numbers are preliminary estimates. Data from the Global Carbon Project and available here. Chart by Carbon Brief using Highcharts. Here’s an informative video on country-by-country emissions.